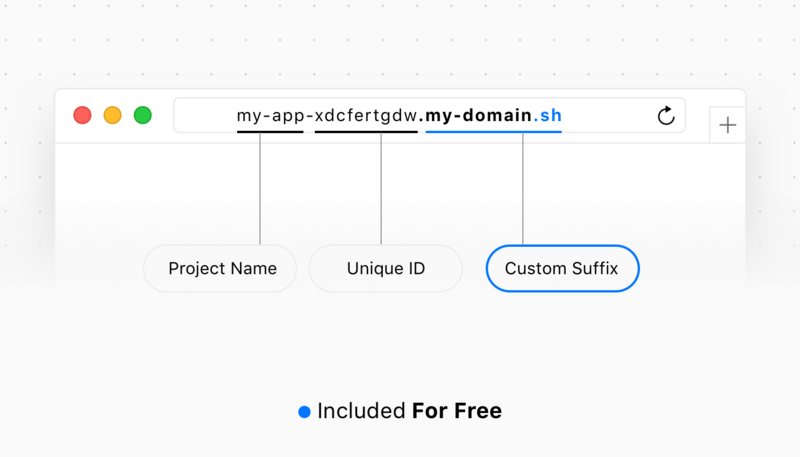 By default, every new deployment receives a unique subdomain ending with .now.sh upon creation. If you want to use a custom domain in place of this suffix, you can enable this add-on. After creating your first deployment, you have probably noticed that the unique URL you received consists of your project's name, a random ID and the .now.sh domain. This is the default for every new customer that signs up for using our service. However, this add-on allows you to switch the suffix (.now.sh) for a custom domain of your choice. * The chosen `.sh` domain is free as long as the add-on is enabled. If the add-on is disabled, the domain will be charged at the renewal date unless removed.